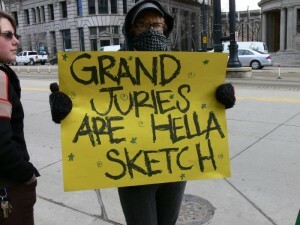 Resist grand jury witch hunts. At least two individuals have been subpoenad to a federal grand jury that appears to be investigating a 2008 fire at the home of an animal experimenter at the University of California, Santa Cruz. “I was approached by two FBI agents at the BART Station at 19th and Broadway in Oakland. They asked my name, identified themselves as Carrie and Matt from the FBI, and served me a subpoena to testify before a federal Grand Jury. They informed me that I had been served and left without asking me any other questions…. In addition to Palafox, at least one other person has been subpoenaed, and another received a visit from the FBI. Grand juries are secret, but there is some information about the scope of this one. The 2008 fire was also at issue in the prosecution of the “AETA 4” on animal enterprise terrorism charges (which were all dismissed). And the prosecutor in that case, Assistant U.S. Attorney Elise Becker, is also involved in this grand jury. I’ll post more information as it becomes available. In the meantime, if you are contacted by the FBI or receive a grand jury subpoena, immediately contact the National Lawyers Guild hotline, (888) 654-3265. Also, watch this video. Next post: June 11th Day of Support for Eco-Prisoners — What Are You Planning?